Mobile device users (iPod, iPad, iPhone, mp3 player etc): The download files are delivered in ZIP (compressed archive) format, so you will need to purchase and download the files using a Windows or Mac computer. The mp3’s can then be extracted and transferred from the computer to your player or tablet device in the normal way. VAT (sales tax) : According to the new EU rules on digital downloads, VAT is now automatically charged for customers within the EU at the rate applicable to your country. Note that VAT will not be added for customers within the United Kingdom or non-EU countries. How do I download the files? You will be directed to a file download page immediately after payment. If you have any problems with downloading the files then Contact Us. Whatever the problem is, we’ll try our best to sort it out for you as quickly as we can! Can I buy CDs instead of downloading mp3s? Absolutely! Click here to purchase physical CDs. They will be posted out to you by standard (non-tracked) airmail. Note that delivery can take anything up to 2 weeks for international orders. 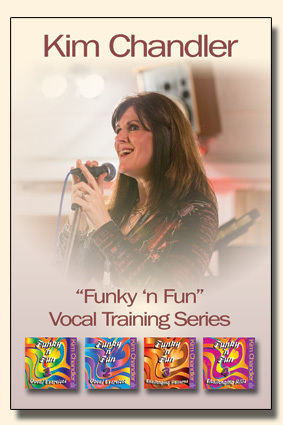 Free “Funky ‘n Fun” course! A 20 page ebook (pdf) containing advice and instructions for each exercise and an 8-level course outline developed by Kim as a logically structured, progressive way of working through the complete set of vocal exercises. Combined, this set has 94 different vocal exercises comprising over 3 hours of instruction for less than the price of a private lesson!